It’s so hard to believe that Thanksgiving is less than 3 weeks away! 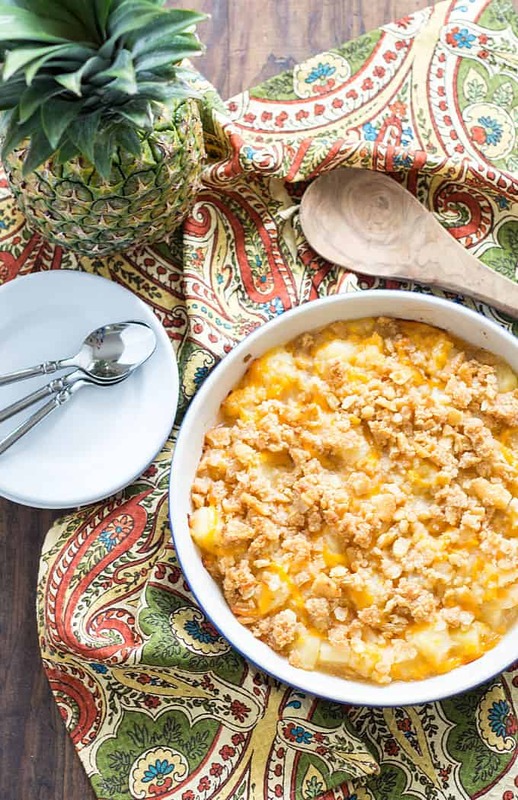 This Pineapple Casserole is definitely a must for your Thanksgiving table this year. 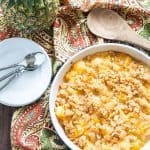 I like to use a mixture of pineapple chunks and crushed pineapple to have various textures of pineapple, but you can use crushed, chunks or tidbits. I also add just a hint of ground cinnamon (1/4 teaspoon), but by all means, add more (or some ground nutmeg!) if you are a lover of cinnamon and/or nutmeg. 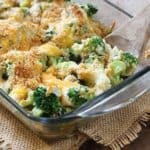 The crunchy, buttery topping truly brings this casserole together. 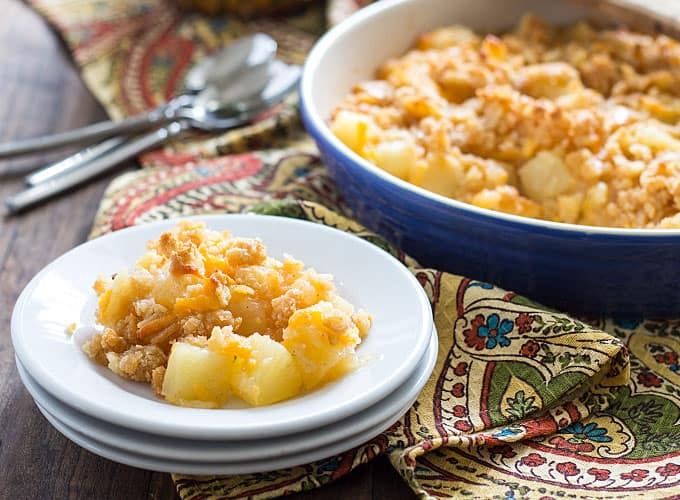 A lot of pineapple casserole recipes only call for buttery crackers and melted butter for the topping, but I add a little pineapple juice to my topping to give it an extra added burst of pineapple flavor. The crunchy, buttery topping is what takes this casserole to a whole new level. Just crush some buttery crackers and mix with melted butter and pineapple juice. OH MY WORD! What’s your favorite holiday dish to make with pineapple? Please let me know in the comments below! 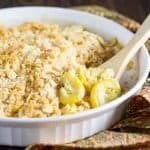 Pineapple Casserole – Cheesy pineapple casserole with a hint of cinnamon and a buttery, crunchy topping. Preheat your oven to 350 degrees F and spray a casserole dish with cooking spray. Whisk together sugar, flour and cinnamon in a large bowl. Add cheese and gently stir to combine. Add drained pineapple and stir again gently to combine well. 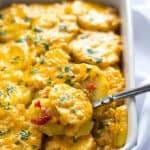 Place pineapple mixture in greased casserole dish. 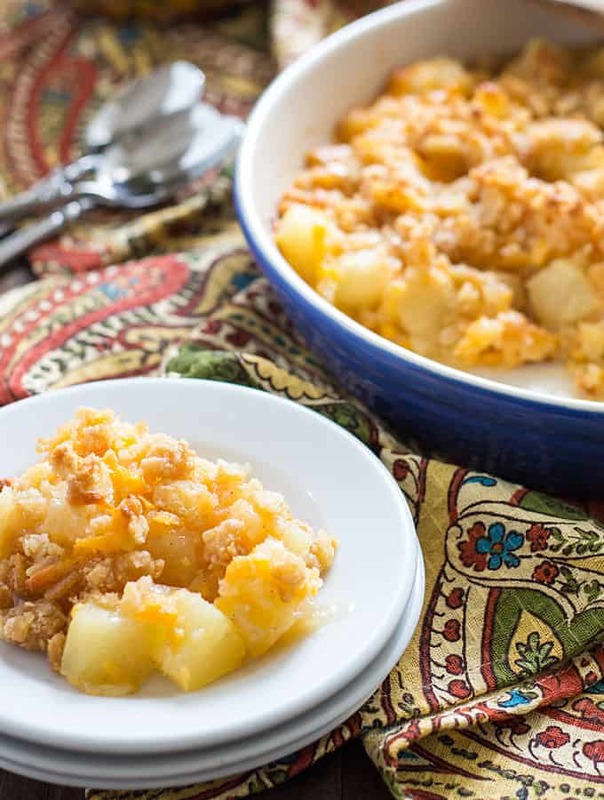 In a separate bowl, mix together melted butter, cracker crumbs and pineapple juice by stirring gently with a spoon. Sprinkle buttery crumb mixture evenly over the top of the pineapple mixture in the casserole dish. Bake (uncovered) for 25-30 minutes, or until golden brown and bubbling around edges. 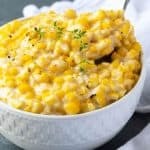 I will definitely be using your version of the recipe this Thanksgiving! Thanks Jo, I hope you enjoy it and have a great Thanksgiving! I remember having this dish at family reunions years ago. I had forgotten just how good it was. I made it to serve along with my New Years Day dinner. It was a hit! Thank you for refreshing my memory. Glad you enjoyed it, Susan! Thanks for sharing your memories. Happy new year! You should send this to Townhouse/Keebler and Dole. 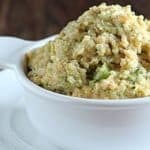 Imagine if you used Townhouse and Dole pineapple! They’d be getting some serious exposure! I’ve had this many times but not with the twists you suggest. Cinnamon? Wow! Also, different textures is a great idea for the pineapple! I’m about one recipe away from having a complete TBC Easter dinner! Thanks so much, Al! I hope you and your family have a great Easter! I know you’re going to have a feast! Sounds exactly what I’m looking for! Are the buttery crackers like Ritz, or are they something else? My sweet daughter-in-law makes this for Thanksgiving and Christmas (per everyone’s request). It is such a refreshing dish to eat. You will never regret having this dish on your table. Just save yourself some trouble and make some copies of this recipe the day you are serving it. I just recently made this for a potluck dinner. It is wonderful! Have made it twice for the family, since then. Hi Jill, Thanks! The cheese melts when it is baked… you can tell better by watching the video. Hope you enjoy! What size casserole dish? I need to double this for our large gathering. 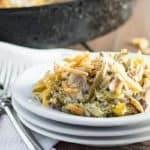 Has anyone ever made this in a crockpot before? Hi Kara, I’ve never made it in a slow cooker… I’m thinking that the topping would probably come out soggy since it would be cooked covered.